My first thought in writing this post was that it would probably be my most controversial post yet. And then I almost started laughing because I couldn’t believe that my most controversial post was one about flour! I’ve been on both sides of the flour-eating spectrum. Growing up, all we ever had in our house was the average all-purpose white flour. That’s what my mom baked with, and that’s what I learned to bake with too. Whole wheat flour was for the “weird” people who did crazy things like buy organic food and use natural products. Once I actually became one of those “weird” people myself, though, I switched completely from using white flour to using only whole wheat flour. And it had to be 100% whole wheat or I didn’t even want to eat it because I felt like it wasn’t healthy enough. I tend to do things in extremes (which I realize isn’t exactly the ideal way to be doing things), but I think I’ve finally found a good balance between completely avoiding whole wheat flour and completely avoiding white or refined flour. I’ve been adding more refined flour into my diet, and I now believe it’s actually healthier for me to be doing so. When you look back throughout history, it’s actually not true that our ancestors ate only whole grains and whole wheat. The reality is that a good portion of the flour that was consumed by earlier generations was refined to some degree. In civilizations such as ancient Egypt and Rome, having bread made from refined flour was considered a status symbol. 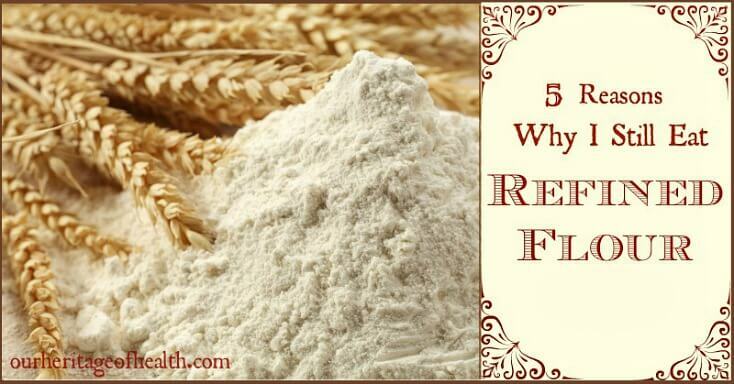 Throughout much of history, refined flour was prized as the flour of the wealthy. Even though the wealthy could afford to buy flour that was more refined than the coarser flours of the poor, many lower and middle class people would still refine their flour by sifting it, especially for special occasions and holidays. It has always been fashionable to try to emulate the wealthy, and refining flour was no exception to this. The topic of which type of flour is the most traditional could be a post in and of itself, but it basically boils down to the fact that the type of flour used varied depending on how wealthy or poor a person was, what sort of food they were baking (a loaf of bread vs. a cake), the occasion they were baking for (a wedding or holiday vs. everyday fare), etc. Most of the time, in early America at least, the flour was usually somewhere in the middle between what we normally think of as white flour and whole wheat flour today. It was made from heirloom varieties of wheat, and it was often mixed with other grains such as barley, rye, and cornmeal when being used for everyday bread baking. The bran of whole grain flours contains enzyme inhibiters such as phytic acid. These enzyme inhibiters are anti-nutrients that make it harder for us to absorb vitamins and minerals from the foods that we eat. Anti-nutrients such as phytic acid can bind to important minerals such as calcium and magnesium and keep them from being absorbed by our bodies, potentially leading to deficiencies of these minerals. When the bran of the grain is removed during the refining process, though, the majority of these anti-nutrients are removed along with it. So, even though refined flour doesn’t have all of the vitamins and minerals that are present in the bran of the grain, because the anti-nutrients have been removed, it doesn’t hinder us from absorbing the nutrients in the other foods we eat either. While whole grain flours should really be either soaked in an acidic medium (like apple cider vinegar or buttermilk), sprouted, or soured (like with traditional sourdough) to neutralize the anti-nutrients, refined flour doesn’t require any of these special preparation methods because the anti-nutrients such as phytic acid have been removed along with the bran. As much as I love my homemade sourdough baked goods, sometimes I’m just not organized enough to remember to feed my starter before I want to bake with it or to remember that I need to plan ahead and prepare my dough the night before I want to bake something. And sometimes I’m just not patient enough to wait! Using refined or partially refined flours is perfect for these scenarios because I can make a batch of biscuits just in time for supper even if I forgot to feed my sourdough starter (again). When I first started using whole grain flour instead of refined flour, I was so worried about making sure that every single thing I ever baked was made with 100% whole wheat flour that had been properly soaked or leavened with a sourdough starter. The problem is, of course, that I don’t always eat in my own home. When I go to a restaurant, or if I’m at a friend’s house, or a church supper, or any other situation where I’m eating food that I haven’t cooked myself, worrying about only eating whole grain baked goods will do a lot more harm than good, especially since stress can contribute to a lot of health issues, including digestion problems. I realize now that it’s a lot worse for my health for me to be stressing over every single bite that I eat than it is for me to just have some white flour once in a while! For those with an allergy or a sensitivity to wheat or gluten, eating refined flour isn’t an option, I realize, but unless that’s the case, it’s really better to just relax and try to enjoy what you’re eating, even it isn’t “perfect” in terms of nutrition. Refined flour is villified a lot these days. In the case of some types of white flour, this may be valid. Flour that has been bleached, bromated, or enriched with synthetic vitamins is not a healthy choice of flour. Plain, un-bleached, un-bromated, un-enriched flour, though, isn’t really bad. It’s just an empty food. 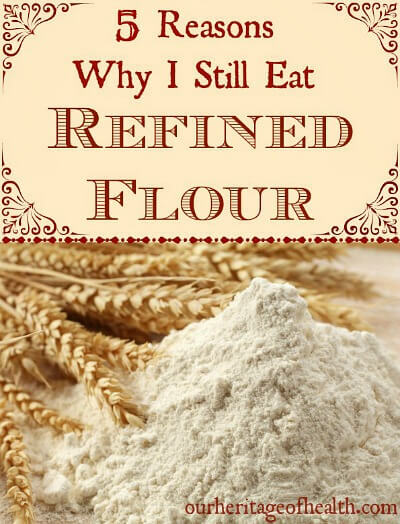 The way I viewed refined flour changed after I read The Nourished Metabolism. From reading this book, I realized that refined flour, like white rice or potatoes, is mainly a source of energy. It’s lacking all of the vitamins and minerals that you would find in properly prepared whole grain flour, but as long as you are getting those vitamins and minerals from other sources in your diet, it’s not really going to do any harm to have some refined flour once in a while. Eating only refined flour baked goods for every meal of every day probably isn’t the best idea, and eating that way over the long term could eventually lead to nutritional deficiencies, but having a dinner roll made from white flour isn’t the end of the world either! The refined flour that was used by those living in past centuries is actually quite different from the refined all-purpose flour that we typically see on grocery store shelves today. To start with, the modern hard red winter wheat that is used for virtually all refined flour products today has been hybridized for higher yield and higher gluten content. Old-fashioned heirloom varieties of wheat such as einkorn, spelt, red fife, etc. were the varieties of wheat eaten by our ancestors. The refined flour of past centuries was also much less processed than most refined flour today. Before the 20th century, flour was simply ground at the mill, and then bolted or sifted to remove the majority of the bran while still leaving the germ intact. Modern refined flour, on the other hand, is usually refined to the extent that all of the bran and germ of the flour has been removed. Modern flour is also often bleached and “enriched” with the addition of synthetic vitamins, which often aren’t very well absorbed and assimilated by the body. When I use refined flour, I typically grind a combination of spelt and barley in my grain grinder, and then sift the flour to remove the majority of the bran. This gives me a compromise somewhere in between whole wheat flour and refined white flour. This is what I usually use for making bread and other baked goods. I also recently started using einkorn flour for baked goods, and I’ve really been enjoying it. I like its flavor, and I love how convenient it is for days when I don’t feel like using my grain grinder but still want heirloom, refined flour. As with everything, balance really is key here. I don’t plan on going back to using regular white refined flour for all of my baking, but I do enjoy being able to use refined flour for baking or being able to eat something made with refined flour without feeling like I’ve forever ruined my health. I used to only use whole wheat flour too! Any recipe that didn’t use whole wheat flour didn’t seem healthy enough to me. But recently I started using all-purpose flour again, although I only purchase the unbleached kind. Keep up the good work! Hi. Thanks for a great post. Would you mind sharing your sources for what type of flour people used in the past? A lot of my sources about the history of flour and the way it was prepared come from 19th century books that I’ve found at antique stores over the years, so I can’t link to them, but if you’re interested in the history of wheat and flour, I’d recommend watching this video excerpt of a talk by the author of Wheat Belly about the different types of heirloom wheat (einkorn, emmer, spelt) and how they were hybridized over the years to become wheat as we know it today. I love this post…this is how I feel about it too. I am curious, what brand of flour do you use? Thanks, Tia 🙂 I’ve only tried one brand of einkorn flour so far, and the one I’ve been using is Jovial. I ordered my flour online because so far I haven’t seen einkorn flour in the grocery store. I got a big 10 lb. bag of flour so it would last me for a while and so I could get free shipping. Yup – I’ve been saying this for a long time! Most of the people in the US are not gluten intolerant! Only about 1% are! The wheat of the old days had a completely different gluten protein structure than the hybridized type available in the stores today! This may be why some bodies don’t recognize it and reject it when it comes to celiac disease! In fact, some people with celiac can tolerate bread made with einkorn or emmer wheat! And there is no GMO wheat – yet – in the United States. Monsanto has developed it, however they withdrew their plan to grow the stuff when some of our biggest importers of wheat said they would not take it! I do prefer, however, to make my bread 1/2 whole wheat and 1/2 all purpose. Once my hubby and I move up to our future homestead, we will be growing our own heirloom wheat! Thanks for standing up on this controversial subject! Thank you, this is what I’ve been saying for a long time! A little more emphasis on the benefits of adding starter to even all white flour should be brought up though. It’s not just missing out on a little vitamin B to not include starter in cookies! The probiotics alone are huge! It goes from a basically dead food, to a live one, whether you grill, broil, bake or slow cook it. I love this post. A Georgia girl’s got to have a refined-flour biscuit and gravy every once in a while! As long as you don’t have an intolerance or eat it to the neglect of other healthy foods, I think a limited amount of grains, even refined, is alright. Thank you for your talk about balance. I think that so often I get caught up in the details and like you said add stress to life that really shouldn’t be there. With all the Paleo talk about grains how do you feel about flours or grains in general? I think it really depends on each person’s situation as to whether or not grains are a healthy option. I personally don’t believe that there’s anything wrong with including grains in moderation as part of a healthy diet. I do think that there’s a big difference between modern grains (especially genetically modified corn) and traditionally-prepared grains, though. I don’t follow a Paleo diet, so I choose to include grains in my diet, but unless I’m eating out at a restaurant, most of the grains that I eat are organic, heirloom grains prepared in traditional ways by either soaking or sourdough. Grains have been a pretty big staple in the diets of many cultures for the past several hundreds and even thousands of years, and that’s old-fashioned and traditional enough for me even though they would be considered modern by those of a Paleo viewpoint. Too bad all your links take you to VGN. I am boycotting them and that horrible woman who runs it! 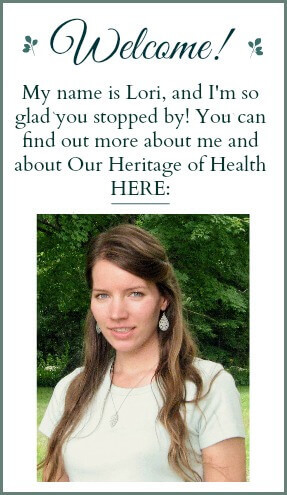 It is horrible what she has done to so many wonderful bloggers in the traditional food world. You need to just add a link directly to Jovial and not to VGN. Sorry venting… great thoughtful article! I’m actually planning to update that link. At the time when I put it in, VGN was partnered with Jovial, but I’m going to change the link now that they are no longer offering Jovial products. I try to keep links up to date as much as I can so that people can find the products they are looking for, but I haven’t gotten around to checking them all on my older posts yet. To me it has never been as simple as “I won’t eat refined flour because it’s (what ever it is)”. To me it’s more like the “fence around the fence”. What do I use the refined flour for? Baking. Baking sugary things, or white bread I will eat with things like jam. Pancakes. Pancakes I eat with sugary things. All the things I make with refined flour are things that make my fibromyalgia and fatigue worse, and that I shouldn’t be eating. I feel better when not eating things made with refined flour. It’s really that simple, and the only reason to why I wish I could stay away from the stuff. But – being a baker, there is nothing to beat the refined white wheat flour in baking. *sigh* I do love my pasta and breakfast rolls with jam and cheese. And so on. So I allow myself to eat those things when it’s time to feast, and if I have managed to stay away from it the rest of the times, it won’t be so bad for my health. I liked much this post. However, I couldn’t understand why you say that “Modern flour is also often bleached and “enriched” with the addition of synthetic vitamins, which often aren’t very well absorbed and assimilated by the body”. Why synthetic vitamins aren’t very well absorbed? You can say it grounded in what kind of study or opinion? There’s actually some debate about whether or not synthetic vitamins are equal to naturally occurring vitamins. Some people believe that there’s no real difference between the two while other people believe that naturally occurring vitamins are more easily absorbed by the body. The basic reasoning is that synthetic vitamins are in an isolated form without all of the co-factors that are part of the vitamins found in foods so they are not as easily recognized by the body. For example, if you were to eat an orange, you would have the naturally occurring Vitamin C, but along with that you would also have all of the enzymes and minerals that are in the orange to complement the Vitamin C as opposed to taking a synthetic Vitamin C supplement which would be only the absorbic acid form of Vitamin C.
Synthetic vitamins are also sometimes in different forms than those that are most easily recognized by our bodies. Vitamin D3, for example, is the form of Vitamin D that our bodies make from sunshine or that we can absorb from eating foods like mushrooms or eggs from chickens who have spent time outside, but many Vitamin D supplements contain the synthetic Vitamin D2 form that isn’t as easily recognized by the body. Nice post with great insight about refined flours. Several years ago I also went crazy upon consuming only whole wheat but it created havoc for my health and over time I started experiencing symptoms of diseases like: nerve pain, gas, bloating, depression, weakened bones, grey hair, brain fog, hormonal imbalances, internal inflammation and what not!! I have come to realize that I do better with refined wheat flour and am not really celiac kind. I feel relieved to know from your post that refined flour can actually be healthy as it doesnt contain antinutrients, a fact that I had never known. Once again, I have started enjoying refined wheat preparations without feeling guilty about them. But the damage done to my body by eating whole wheat over years will take some time to go. Thanks for the great info. I’m glad to hear that you can enjoy things made with refined wheat without feeling guilty, and I hope that your body will heal quickly and that you’ll be symptom-free! Hello there!! I really enjoyed reading this post, like a huge relief. I´m kind of bouncing back to baking (since it was something I looooved doing before college) and I´ve been obssesed on having all my perfect, healthy, animal/envorimental friendly ingredients…but!! I didn´t knew how expensive it can get!!! that on the economic side, but also in the psychological side… this gives me reassurance that in baking as in life, everything in moderation!!! Thank you!